All you can eat Pancakes, eggs, sausage and homefries. Visit with the Easter bunny. Easter egg hunt with breakfast ticket 9:15 am and 11 am. Also basket raffle and 50/50. $7 adults. Kids 3 and under free. This one’s a “fun-raiser” for the OESJ Class of 2020. Family fun! The “Spring Fling” Craft Fair, Mini Golf and Games at OESJ Junior/Senior High School in St. Johnsville. Plus carnival games, food, raffles, and more! The Canajoharie Youth Center is having a fund drive. The boot drive will be in multiple spots in Fort Plain and Canajoharie. They’re also having an open house at the Center, with vendors, crafters, the Montgomery County Sheriff’s K9, photos with real bunnies, and a bake sale. Proceeds will will help replace money used to fix the roof last year. NBT Bank is matching $1,500 in donations. 23rd Annual Fritter Supper in the Social Hall of Jordanville Federated Church, 209 Main Street, Jordanville. Deep fried fritters with real maple syrup, scalloped potatoes with ham, green beans, coleslaw, applesauce and strawberry shortcake make up the menu. Adults, $11.00; Children under 12, $5.50; Under 5, Free. Take outs available. Bingo fundraiser at the Willowvale Fire Company, Oneida Street in Chadwicks. Proceeds go to Believe 271 to help Firefighters and Auxiliary members with life threatening illnesses. 19 Games with door prizes after each game, prizes will be doubled for all regular games! Must be 18 or older. 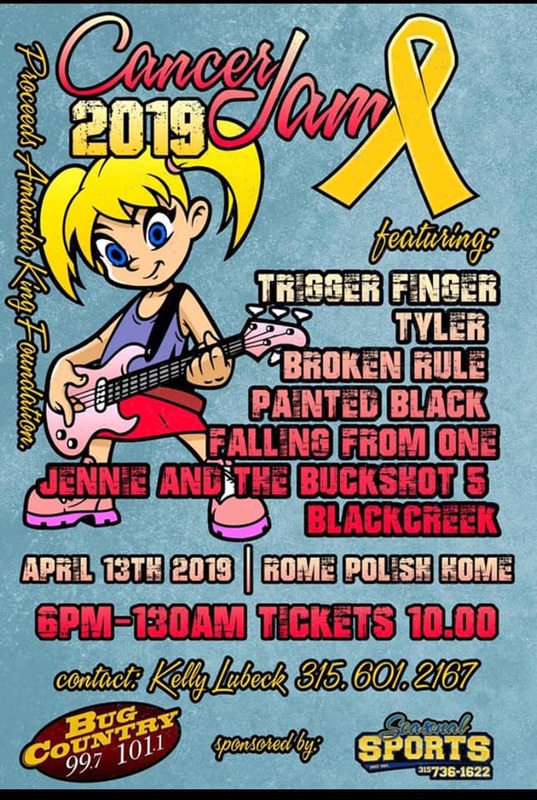 Bug Country is sponsoring the annual Cancer Jam at the Rome Polish Home from 6pm-1:30am. Music from 7bands: Broken Rule, Falling From One, The Band Tyler, Jennie and the Buckshot 5, Painted Black, Trigger Finger, and Joe Vandresar. Food trucks and raffles. Proceeds benefit the Amanda King Foundation and local cancer programs. Hosted by Bug Country's Brittany Lee and Dave Silvers.